These numbers reflect estimated student expenses for the 2018-2019 school year. Amounts will change slightly from year to year, but as the cost of college increases, the scholarship packages will correspondingly increase. Your official financial aid award will be included in a letter directly from UChicago. 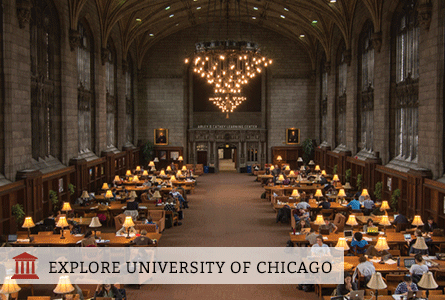 The University of Chicago (UChicago) understands that many students who enroll are awarded funding from outside organizations. UChicago awards families their full demonstrated financial need and therefore outside funding will affect the amount of university funding we provide. In addition, federal regulation sometimes limits the total amount of grants and scholarship awarded. QuestBridge Scholars can expect that we will do our best to maximize all outside funding they receive. The University of Chicago requires all students to have health insurance, either through their parents or another plan. If the student is not covered by a parental plan, the University grant will be awarded to cover the cost of the basic student health plan. The Cost of Attendance allows for modest travel that is included in personal expenses. The student contribution from savings varies depending on the total assets a student has. Typically, a student is expected to contribute 20% of the reported assets during each of the four years of undergraduate enrollment. Note that the student asset amount affects the total university grant offered. The University of Chicago guarantees to meet 100% of demonstrated need and is 'need-blind' in its selection of first-year students. Approximately 60% of students receive financial aid. Use the University of Chicago's Net Price Calculator to determine the financial aid for which you are eligible.